Vibrantech wordpress theme is a clean and good looking blue wp design with rounded corners. The header contains the blog’s title and tag line in the upper left corner, followed by a thick black row filled with links to your pages. On the right corner there is the RSS news feed icon. This is followed by a thick white fow where you can put in your blog’s description or ads. Overall this is a 2 column wordpress skin with main content area located on the left side. It is white with black text. The sidebar is on the right and has blue background with white text and links. The sidebar is wordpress widgets compliant. Vibrantech wordpress template was designed by Michael Kelsinger. 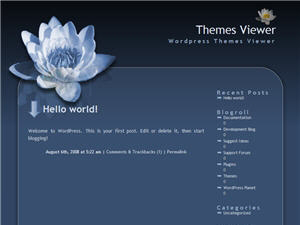 Revolution Code Blue wordpress theme is a clean and simple WP design. The header background fades from dark to light blue. It contains the blog title and tagline. On the right side is a place holder for advertisment banner (468 pixels width x 60 pixels height). Above it are two RSS feed icons. Main content area is white and possitioned on the left. On the right side are two sidebars. 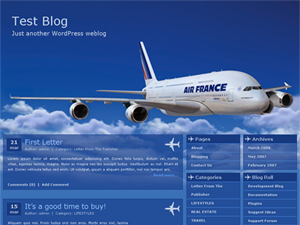 The first one supports wordpres widgets and contains all the standard wp elements. The far right sidebar contains a list of recent posts. It would be a good location to place google adsense. 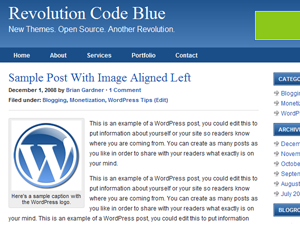 Revolution Code Blue wordpress template was designed by Brian Gardner. 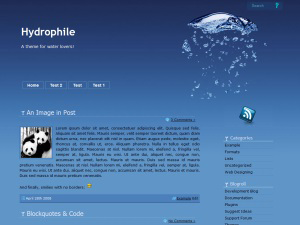 iTheme wordpress template is a clean and elegant blog design. 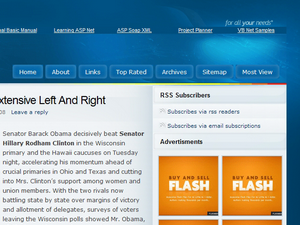 This is a 2 column wp theme with main content area located on the left and sidebar on the right. The sidebar supports wordpress widgets (so remember to enable them in your blog’s admin area – under Appearance tab). The sidebar elements can be switched by a simple mouse drag and drop which is a very nice feature. Any visitor can rearange the sidebar. Header and background graphic contain some elegant curves. The blog’s search function in in the top right corner. 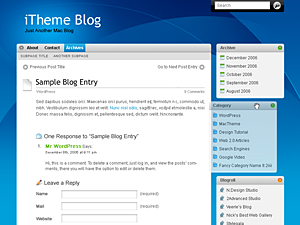 iTheme wordpress theme was designed by N.Design Studio. La Delicious wordpress theme is a beautiful and simple wp design made with natural colors. In the header image on the right side there is an an image of some fruit (orange, lemon and apple) with some green leaves around. Similar, but smaller image is also present in the footer (right corner). Overall this is a two column wordpress theme. 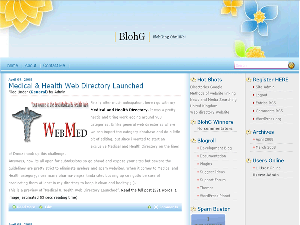 Main content area is white (black text) while main theme’s background is blue. The search window sticks out of the frame (like an ear to the face) and is located on the left side. Sidebar menu is classic (no wordpress wigets). 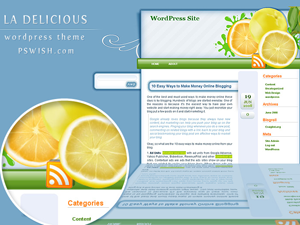 La Delicious wordpress template was designed by Lorelei.